To cater the variegated demands of our clients, we are highly engrossed in manufacturing a qualitative range of Steel Door Closer. 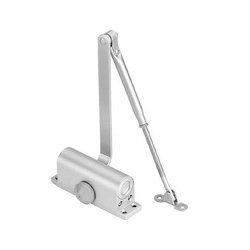 Being a leader in this industry, we are devoted towards providing a premium quality array of Heavy Duty Door Closer. Keeping in mind the specific needs of our clients, we have provided them with a wide gamut of Door Closers. These products are used for preventing the doors from opening when unlocked. We make use of finest grade raw material and skilled manpower to manufacture these products. We also manufacture Brass M6 Screws for Door Closers in different sizes i.e. 17mm, 28mm, 30mm, 33mm etc. Special size can also be developed as per drawings/samples. With the valuable assistance of skilled team of professionals, we are engaged in offering an extensive range of high-quality Door Closer. How to install door closer - standard installation / tell manufacturing, inc.